Here you'll find the latest updates on everything Forteza. Forteza Caribbean Chocolate announced the implementation of a plan to produce and distribute among local farmers about 12,000 high-yielding cocoa trees between 2019 and 2020, with the support of the Department of Agriculture of Puerto Rico and the United States Department of Agriculture. United (USDA for its acronym in English). The distribution of these trees will serve to increase the supply of cocoa grown in Puerto Rico for the company, as well as its production of fine chocolate. It will be held at a rate of about 4,000 trees on a quarterly basis, beginning next April. 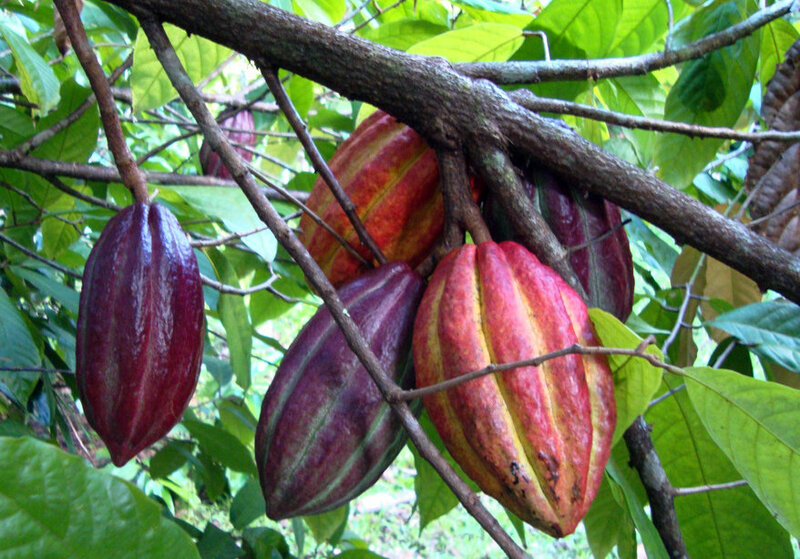 The varieties of cocoa trees to be distributed consist of grafts of the 10 most productive and best quality varieties of the experimental station from the USDA Tropical Agricultural Research Station (TARS) in Mayagüez. Looking to highlight Puerto Rico’s potential to produce a high-quality cocoa and in recognition of local producers, the opening of the 2019 edition of the National Fine Cocoa and Aroma competition, through which cocoa bean samples will be chosen to compete at the prestigious International Cocoa Awards. The National Fine Cocoa and Aroma competition constitutes the starting point for the selection of the three best local cocoa bean samples, which will be sent to compete on behalf of Puerto Rico at the International Cocoa Awards in France, sponsored by the Cocoa of Excellence program. The deadline to submit samples is Jan. 11, 2019. Producers interested in participating may contact coex.puertorico@gmail.com to receive more information about the participation requirements. “Mi biggest inspiration has been my great-grandfather, my grandfather and my father because this is a family business and it has been going on for 90 years. It represents a product, which beyond being a product on the shelf, represents the culture of Puerto Rico and the Dominican Republic”. We want to thank all the media that accompanied us during our press conference held yesterday in Chocobar Cortés on the occasion of the launch of our Forteza One Bars. Forteza founder, Eduardo Cortés also discussed our plans to encourage the cultivation of cocoa in Puerto Rico. We had a blast at this years Coffee & Chocolate Expo at the San Juan Convention Center. Many of you stopped by our booth to try our chocolate and learn more about our process. We are forever grateful for the support! ¡Que bien la pasamos en el Coffee & Chocolate Expo este año! Muchos de ustedes pasaron por nuestro booth a probar el chocolate y aprender sobre nuestro proceso. ¡Estamos eternamente agradecidos por todo el apoyo! We've partnered even further with one of our cacao suppliers to bring you a very special Valentine's Day gift set. Hacienda Aceitunas not only grows Puerto Rican cacao but also beautiful tropical flowers. For Valentine's Day we will be offering a limited edition set of our Bon Bon Box with a flower arrangement from Hacienda Aceituna's fresh tropical flowers. Buy it in our online shop and pick it up on our factory on February 13th or 14th so those chocolate and flowers arrive fresh to your loved ones! Nos hemos asociado aún más con uno de nuestros proveedores de cacao para ofrecerle un conjunto de regalo muy especial para el Día de San Valentín. Hacienda Aceitunas no solo cultiva cacao puertorriqueño sino también hermosas flores tropicales. Para el Día de San Valentín, ofrecemos un juego de edición limitada de nuestra caja de bombones con un arreglo floral de las frescas flores tropicales de Hacienda Aceitunas. Cómpralo en nuestra tienda en línea y recógelo en nuestra fábrica los días 13 o 14 de febrero para que los chocolates y flores lleguen frescos a tus seres queridos! We're in Freehand Hotel NYC! Forteza Caribbean Chocolate has been selected to be sold in Freehand Hotel in New York City on its exclusive Freehand Shop. Look for us in their Flatiron location! Forteza Caribbean Chocolate ha sido selecionado para venderse en un nuevo hotel en la ciudad de Nueva York llamado Freehand Hotel. Encuentra nuestros chocolates en su exclusiva tienda Freehand Shop. Great story about the cacao industry in Puerto Rico on one our favorite websites out there; Merodea! Check out the article and read up on how Forteza is reviving the cacao industry in our island in the following link: 4 Hechos de la industria de Cacao en PR. Tremendo artículo sobre la industria del cacao en Puerto Rico en uno de nuestros websites favoritos; Merodea! Lea sobre cómo Forteza está reviviendo la industria del cacao en nuestra isla en este enlace: 4 Hechos de la industria del Cacao en PR. The ravages of hurricane Maria, which also destroyed 35% of the cacao plantations on the island, have not stopped our strategies and growth plans. We just launched our Bon Bon line from Forteza Caribbean Chocolate a month ago and soon will do the same with our new product line of chocolate bars in five different flavors, all made with fine chocolate. In an interview with El Vocero, our founder Eduardo Cortés, explained that despite the challenges experienced by Puerto Rico, it is up to the companies to continue with their plans to lift economic activity from all areas. Cortés depends on the agricultural production of cacao in Puerto Rico, a sector that has been promoting initiatives with farmers for several years now, and now faces challenges of returning to propitiate the development of the lost plantings, just when they were already beginning to give fruits. Los estragos del huracán María, que también arrasó con un 35% de las siembras de cacao en la Isla, no han detenido las estrategias y planes de crecimiento para la empresa puertorriqueña Cortés Hermanos, que hace un mes lanzó su línea de Bombones Forteza y próximamente hará lo propio con su nuevo producto de barras de chocolate en cinco sabores, todos confeccionados con chocolate fino. En entrevista con El Vocero, explicó que a pesar de los retos que experimenta Puerto Rico, corresponde a las empresas a continuar con sus planes para levantar la actividad económica desde todas las áreas. Cortés depende de la producción agrícola del cacao en Puerto Rico, un sector que impulsa desde hace varios años con iniciativas en conjunto con agricultores, y ahora enfrenta retos de volver a propiciar el desarrollo de las siembras que se perdieron, justo cuando ya comenzaban a dar frutos. We're heading to the International Cocoa Awards! Cacao beans used in the Forteza production have already been measured successfully against 166 samples from 40 countries with a long tradition in the industry. The product of one of our supplying farmers was placed among a selection of the best 50 samples worldwide, in the International Cocoa Awards, of the Cocoa of Excellence Programme. Next October 30th will be the final selection of the 10 best samples and all will be celebrated and recognized at the Salon du Chocolat in Paris, France. Granos de cacao utilizados en la producción de la marca de chocolate fino FORTEZA, que es parte de la empresa puertorriqueña Cortés Hermanos, ya se midieron con éxito frente a 166 muestras de 40 países con larga tradición en la industria. El producto de uno de sus agricultores suplidores se colocó entre una selección de las mejores 50 muestras a nivel mundial, en el International Cocoa Award, del Cocoa of Excellence Programme. El próximo 30 de octubre será la selección final de las 10 mejores muestras y todas serán celebradas y reconocidas en el Salon du Chocolat en Paris, Francia. Lee más sobre esta historia publicada en El Vocero y conoce el resto de los Mejores 50 del mundo aquí. Eduardo Cortés, vice president of operations of Cortés Hermanos and Forteza founder, participated in the "Agriculture Rocks!" panel during Agrohack, an event that adds to the efforts in Puerto Rico to promote the connection, information and direction on the agricultural sector as a sustainable source of economic growth and development in Puerto Rico. Agrohack brought together various components of the industry, such as farmers, agrobusiness, agronomists, educators, food executives, distributors, suppliers, vendors, communicators, government officials, transport companies and technology providers, among others. Eduardo Cortés, vicepresidente de operaciones de Cortés Hermanos y fundador de Forteza, participó en el panel “Agriculture Rocks!” durante Agrohack, evento que se suma a los esfuerzos en Puerto Rico para promover la conexión, información y dirección sobre el sector agrícola como una fuente sostenible de crecimiento y desarrollo económico en Puerto Rico. Agrohack reunió a varios componentes de la industria, tales como agricultores, agroempresarios, agrónomos, educadores, ejecutivos de alimentos, distribuidores, proveedores, vendedores, comunicadores, funcionarios gubernamentales, compañías de transporte y los proveedores de tecnología, entre otros. The National Ballet of Cuba returned to Puerto Rico with its legendary choreography "Giselle", and FORTEZA Caribbean Chocolate was there to welcome those present to the Center of Fine Arts of Santurce with a tasting of our chocolates enlivened by the music of The Violins of Marquito. Before going to the Festival Hall to enjoy the ballet led by the "Prima Ballerina Assoluta" Alicia Alonso, the attendees savored the four varieties of FORTEZA as they danced and enjoyed the rhythm of the music. The National Ballet of Cuba presented two performances before full house in the Hall of Festivals and FORTEZA is proud to support such a great artistic show. El Ballet Nacional de Cuba regresó a Puerto Rico con su legendaria coreografía “Giselle”, y FORTEZA Caribbean Chocolate estuvo ahí para darle la bienvenida a los presentes al Centro de Bellas Artes de Santurce con una degustación de nuestros chocolates amenizada por la música de Los Violines de Marquito. Antes de pasar a la Sala de Festivales para disfrutar del ballet dirigido por la “Prima Ballerina Assoluta” Alicia Alonso, los asistentes saborearon las cuatro variedades de FORTEZA mientras bailaban y gozaban al ritmo de la música. El Ballet Nacional de Cuba presentó dos funciones ante casa llena en la Sala de Festivales y FORTEZA se enorgullece de poder apoyar tan magno espectáculo artístico. Enoteca de Ballester Hermanos was the scene of The Whiskey Experience, an activity in which the participants delighted their palate with a pairing of the four varieties of Forteza Caribbean Chocolate with four whiskeys specially selected for the occasion. 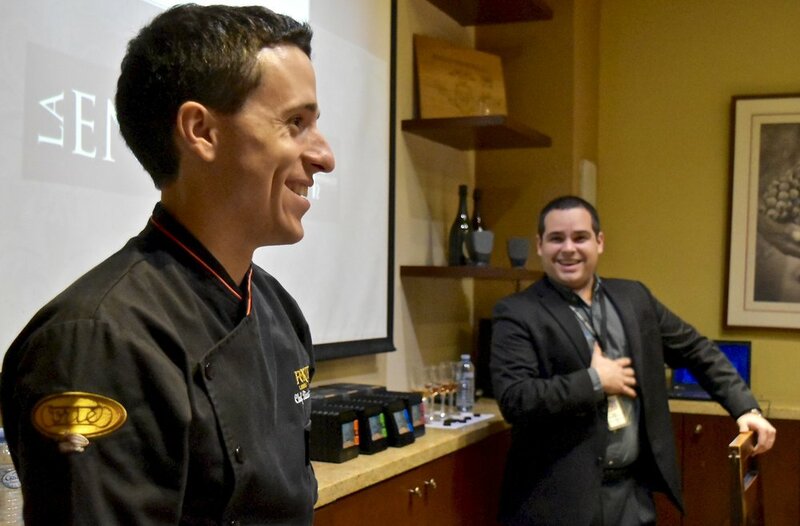 Chef Ricardo De Obaldía, from Casa Cortés ChocoBar, and sommelier José A. Ramírez de Arellano, from Ballester Hermanos, explained the characteristics of each of the chocolates and whiskeys and why they recommended the individual pairing between them. La Enoteca de Ballester Hermanos fue el escenario de The Whiskey Experience, actividad en la que los participantes deleitaron su paladar con un pareo de las cuatro variedades de Forteza Caribbean Chocolate con cuatro whiskeys especialmente seleccionados para la ocasión. El chef Ricardo De Obaldía, del Casa Cortés ChocoBar, y el sommelier José A. Ramírez de Arellano, de Ballester Hermanos, explicaron las características de cada uno de los chocolates y los whiskeys y porqué recomendaban el pareo individual entre ellos. From the harmony of the elegant flavors that combine to delight the most demanding palate arises A Marriage of Flavors, where the forces of Gray Goose and Forteza Caribbean Chocolate, the best dark fine chocolate of the Caribbean, joined forces. A Marriage of Flavors, hosted by hosts Ignacio J. Cortés Shehab, Commercial Vice President of Cortés Hermanos, and Eduardo Cortés Shehab, Vice President of Operations of Cortés Hermanos with Lourdes Escasena, Marketing Manager of Gray Goose. They were present to give a warm welcome to the guests of the evening, and assured that this would be the first of a series of gastronomic events that will be held during the year. De la armonía de los elegantes sabores que se combinan para deleitar el más exigente paladar surge A Marriage of Flavours, donde se unieron las fuerzas de Grey Goose y Forteza Caribbean Chocolate, el mejor chocolate dark fino del Caribe. A Marriage of Flavours, contó con los anfitriones Ignacio J. Cortés Shehab, Vice Presidente Comercial de Cortés Hermanos, y Eduardo Cortés Shehab, Vice Presidente de Operaciones de Cortés Hermanos junto a Lourdes Escasena, Gerente de Mercadeo de Grey Goose. Los mismos estuvieron presentes para dar la cordial bienvenida a los invitados de la velada, y aseguraron que éste sería el primero de una serie de eventos gastronómicos que se estarán celebrando durante el año.